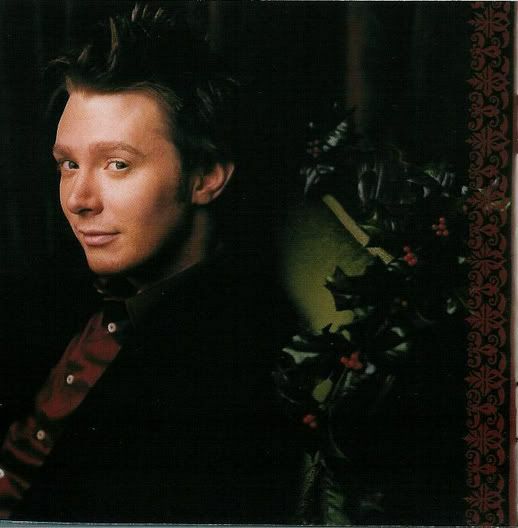 This thread will be for any and all Christmas pix -- the CD and the concerts! I'll start. Please read this lovely tribute written by our very own outthereforclay, who was inspired, no...forced to express her feelings about this picture in the way that only she can. Thank you for letting me post this Amy! This is a man. An adult. He is a realized person. He has knowledge, wisdom, savvy and awareness. He is mature and confident. He is comfortable with himself and exudes welcome. He is honest and candid and has little he cares to hide. This is also a fun-loving youngster. He plays pranks on his friends and loves to laugh. He is generous. This man is also lethal. He has a fire inside that his eyes give windows to and it is a very hot, very potent fire. It hints at a conflagration of beautifully disastrous proportions and then tells you you’ll be safe in the flames. He’ll protect you, comfort you, be there for you. But mostly. Someone looking at the Clay in this picture and drawing conclusions about him would say this is a grown up. And I believe they most likely would say that this is a man worth knowing. For those of us women who already know Clay, those of us who in our hearts, are his friend or sister or mother or lover, this picture is another kind of miracle. We see the face here and we immediately scramble for one of those early pictures of Clayton Aiken, maybe the one at the Atlanta audition, where he stood---all angles and sharp edges---peering through his comical thick glasses and making a statement with jutting sideburns that were improbably dark. The one that shows a gawky, self-conscious boy who though working hard at appearing confident and in control, wants so badly for his talent, his worth to be recognized---someone who wants to be a winner. Where did that boy go? We fans have watched him fade and if not exactly disappear, then perhaps give way. We’ve cried at the injustices that battered what we thought was a young, fragile, inexperienced and oh-too-innocent spirit in a business known for its ruthless exploitation of such babes. We wanted the best for him. We gave him both our best and, in some unfortunate displays, our most shameful support. And we drank in everything he gave us during that journey from there and then to here and now. To us—his fans, the ones who have poured over every picture, video and snippet of him, who does this picture show? What is so special about THIS picture? Who is the man in this picture? First the physical...the face. 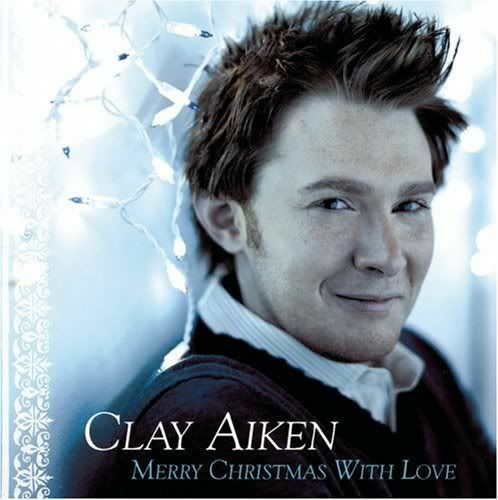 When I think of that picture of Clay singing “Always and Forever”, I think lines and planes and sharp edges. I see those chiseled, almost painfully prominent cheekbones, at the same time unbelievably beautiful and frightening. I remember the near gauntness of his frame, the stooping of his broad but seemingly lightweight shoulders that seemed to suggest the ability to bear only lightweight loads. Of course, we soon learned differently, but still…then, the picture suggested such things. I recall the contrasts in colors. The improbable color of his dark, stark, jutting sideburns on his almost sickly pale, freckled skin. To hear this description one would gather that he was not beautiful. But he was. Even then. Maybe especially then. We fell in love with that man, that boy. And we’ve been faithful lovers to him, loving him in every picture, through every eccentric fashion choice and hair color, and for everything he’s given of himself. And, I like to think we may have helped bring about, or perhaps encouraged Clay to realize himself that he is the man in this picture. There are no sharp lines in this face. No sign of gauntness or hollows asking to be filled or finished. This face has no precipitous edges from which he might teeter and fall. This face is full and solid and soft with maturity and realization. The lines that we might detect are the parallels and symmetries. The…perfection of the features. His sideburns, still jutting and still dark, now complement the direction and noble line of his nose. The eyebrows are wild yet lovely and expressive. The wrinkled lines at the corner of his eye speak volumes of his wisdom, his capacity to laugh and love, of his very heart. And the matching curved lines around his mouth serve as evidence that that love of laughter is inseparable from the man. This is the face of a man who is comfortable in his skin…his freckled skin that he now and without apology boldly reveals to us. The powers that be who insisted on packing layers on his face in an effort to cover these beloved pieces of Clay have been vanquished by the man’s own powerful spirit. I like to think that each proud freckle in this picture represents someone in Clay’s life who ever doubted him, ridiculed him, lied to him or left him. And, of course, he is indeed a man, his ruddy stubble letting us know that were he of a mind, he could have a beard that would, no doubt, make some women swoon. Other women, of course, would lament him hiding even one copper dot, one vanquished foe. The lips in the Mona Lisa smile define Clay…this modern day Clay. They hint at playfulness but can’t lose their sensuality, even as their usual fullness is lessened by his grin. We will still fantasize about these lips and about the freckles that crown the tips of the bow. He knows this, of course. He so knows this and plays with us with that knowledge. You can see it in his eyes. The man in this picture is a flirt. His eyes refuse to let us leave them. He entices us and charms us and loves doing it. WE know this, of course. 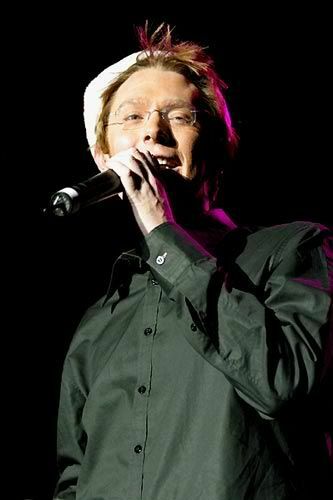 This is not a picture that offers the opportunity to fall into the green pools, the emerald isles, the jade jewels or any literary attempt to capture what Clay Aiken’s eyes are. This picture instead gives us a ticket into Clay’s heart and soul, his spirit, his light, his real-ness. And the price of this ticket, as we all know, is only our own hearts and souls. We acknowledge and agree to pay this price every day we hear him sing to us or we listen to him talk to us from the stage, making us feel he knows us so very well and that he’s so glad to see us again. We put our tokens on the table every time we watch him turn himself inside out as he pours it all into “Solitaire” or revs it up in “I Survived You” or tells the truth in “Measure of a Man”. We gladly part with the toll any and every time, if only he will never go away. That is our only condition to the unconditional love we give him back. That he must promise never to leave us. For if the unthinkable ever were to happen---if Clay’s voice were to cease to be heard or his face were to cease to be accessible for us to gaze at---if the hope and goodness and friendships and laughter---if the JOY that he brings to all of us were to end, it would have to be because HE left US. After all, we never considered giving up on that boy in Atlanta with the chiseled cheekbones and the carefully disguised uncertainty. Now, two years and many tears and hearty laughs later, we will never leave the man in this picture. No, not this man in whose face we find a strong and welcoming, warm confidence, a palpable love of life and laughter, and---perhaps most profoundly--- that gift of pure joy that the man and his voice bring—a joy that has become a part of our lives now…a joy we literally cannot imagine living without. He knocks my socks off!!!!!!!!!! Can not wait till November!!! You know he has the capability even in a picture to make you think he's looking only at you!!! and I like it!!! oh yes I do!!! Holy <censored> Delicious !!!!!!! He does it to us every time doesn't he ladies !!! There's a whole thread for one picture? Besides, there are three pix now. 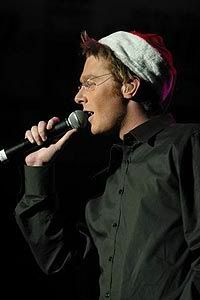 this are obviously dated, but he looks so cute in a santa hat! OH YES FROM THE BEGINNING HE STOLE MY HEART AND NOW WHEN I SEE THAT NEW CHRISTMAS PICTURE I WANT HIM TO RUN AWAY WITH IT AND NEVER RETURN IT. IT IS FILLED WITH SO MUCH LOVE FOR HIM THAT IS UNDESCRIBABLE. I LOVE HIM MORE AND MORE EVERYDAY. THANKS AMY. YOU SAID IT IN A WAY THAT I COULD NOT HAVE.